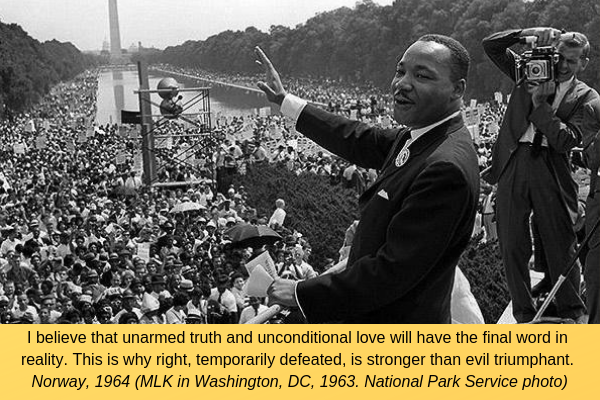 Over the past few days, we have honored Martin Luther King, Jr., in so many marches, conferences, events marking his birthday and reaffirming our own commitments to his message of equality, justice, and rights. For most of us, his message has stood in stark contrast to the racist, mean-spirited and cruel messages and policies pouring out of the White House -- that include a new bill by Senate Republicans that embodies Trump's latest "art of the deal" described in another nationally televised announcement on Saturday. Our immigrant communities, our allies -- all of us -- can take heart and inspiration from the words and actions of Dr. King, not just on his birthday, but in our daily struggle for justice. We are reminded of the persistence and commitment of the civil rights movement of decades past and as it continues today as we push back against the calls to racism and xenophobia by Donald Trump. Donald Trump's "major announcement" Saturday was another version of his Jan. 8 televised proposal, employing his now-familiar tactic of hostage-taking. There don't seem to be many takers, as Democrats quickly denounced his proposal of a trade-off for border wall funding, while hard-liners claimed that he was proposing some type of "amnesty" (he's not). $4.2 billion for 52,000 detention beds and other detention supports. Trump proposes a 3-year provisional status is proposed for DACA and TPS recipients, with additional restrictions. However, DACA recipients will now continue their status for at least a year, as the Supreme Court has just decided it will not take up the Trump Administration's challenge to a lower court ruling, so the program stays in place, for now. Similarly, there are legal challenges to ending TPS, and various legislative proposals are being considered to provide permanent solutions for both DACA and TPS recipients. The prolonged shutdown has put pressure on both the White House and all members of Congress, and the Trump/Republican Senate proposal is supposedly aimed at ending the shutdown with some type of compromise. However, the Republican and Democrats' bills are wide apart and neither is expected to get the 60 votes for passage. Moreover, Dreamers, affected communities and most advocates have consistently called for no trade off for the border wall. Trump's obsession with building the wall has been transparent: to reinforce his racist campaign promise to his supporters to keep immigrants out of the country. Increased border enforcement and militarization, including border barriers, have forced migrants and asylum seekers to travel under more dangerous conditions, sometimes resulting in deaths; these border enforcement measures have undermined environmental protections and health; and they are extremely costly. Most illicit drugs enter the country through ports of entry, not between them, and the emphasis on drug trafficking has had little effect on the health crisis of drug addiction in the U.S. As for terrorism -- even DHS has had to admit that no terrorist has ever been arrested at the southern border. The wall and border control proposals do not constitute responsible and humane border governance, and certainly do not facilitate U.S. responsibilities and obligations towards asylum seekers. We do need to address the complex, short and long term issues of immigration. But these proposals undermine any informed consideration and do not move us towards more just and fair policies untainted by racism and xenophobia and the intentional criminalization of immigrants. Join the chorus of opposition to a deal cut on the backs of asylum seekers, DACA, TPS recipients and unpaid federal workers! Send a message to your members in Congress -- they need to hear from ALL of us! No deal for the border wall, nor for the expansion of Trump's harsh enforcement programs. Invest in our communities, not a border wall. Be sure to follow us on Facebook and Twitter for timely news and visit our website for information and resources.